We all have "stuff" lying around. Too much stuff needs a home and many of today's homes don't have sufficient storage space. Maybe you just need a few shelves here and there, or somewhere to house your ever-expanding CD and DVD collection, or a little space to make an office. This lovely and practical book has 23 step-by-step projects like shelving units, tables, storage boxes, or outdoor goodies to make. They give you all the necessary instructions on how to construct your particular storage item from scratch. It would help if you knew something about basic carpentry otherwise, for me at least, it would be easier to get something custom made. Not everyone is handy with a saw and screwdriver but at least you can buy things made to order so that's a great help. There are many ideas you can glean from these inspiring pages. However, if you're not into doing your own woodwork, they give you details of what you need, right down to the last 3/16 of an inch. A list of tools will help you get the results you'll be looking for, and there are templates too. I liked the idea of the letter rack on page 26, especially when there are lots of people living under one roof, like students sharing a dorm. Also, the bathroom trays on pages 74/75 are a great idea. 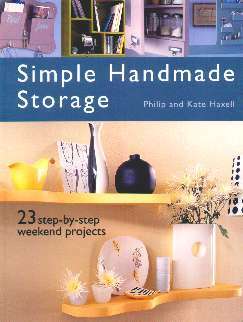 Simple Handmade Storage may be purchased and/or ordered through your local bookstore. Conclusion - This might just be the perfect gift for the handy person in your life, who has been itching to make things for around the house.